Jim Acosta is at it again, shouting “gotcha” questions at President Trump at the most inappropriate times, most recently at the White House Easter Egg Roll where the president was coloring with his family and small children attending the event. Demanding to know why President Trump killed DACA, which was actually killed by Democrats in Congress, Acosta was relentless, drawing the ire of Trump campaign manager Brad Parscale, who suggested that Acosta’s constant outbursts justify pulling his press credentials. Many fellow journalists have also had enough of Jim Acosta and his embarrassing demands to be the center of attention. Hiding behind the First Amendment and invoking what he believes is his constitutional right to shout questions at the president and even repeat the same question someone else has just asked to embarrass the Trump administration is standard modus operandi for fake news CNN’s White House correspondent. Responding to Parscale’s scolding tweet, Acosta replied that he was only exercising his First Amendment right and that Parscale should read the First Amendment. No more than screaming “FIRE!” in a crowded theater does Acosta have a right, First Amendment or otherwise, to disrupt a White House social event. I suggest it is Acosta who needs the constitutional lesson. President Trump has been more than gracious putting up with Acosta’s regular outbursts. Were I the president, I would ban him from the White House and advise CNN that they have one opportunity to send a replacement. If Acosta’s replacement also insists on dominating press conferences and even social White House events, I would let the fake news network understand, in no uncertain terms, that not only will Acosta’s replacement be banned, but the entire network. Membership in the White House Press Corps is a privilege, not a right. Members and their correspondents serve at the president’s pleasure and can be removed at any time for any reason. More outbursts and tantrums from fake news CNN’s White House Correspondent…. Your "job" does not involve the constant disruptions or tantrums for which you are famous, nor does the First Amendment give you any such right. Your membership in the White House Press Corps is at the president's pleasure. It is a privilege, not a right! President Trump’s 2020 campaign manager, Brad Parscale, said CNN’s White House correspondent Jim Acosta should be stripped of his press credentials for trolling the president when he was interacting with children during the WH Easter egg roll. Parscale double-downed on an earlier tweet, when he said Acosta’s press credentials should be suspended for his disrespectful behavior. Acosta has a long track record of shouting out of turn at White House press briefings and other events. There’s no doubt that sometimes a reporter has to shout in order to be heard, but the inappropriate timing of Acosta’s latest outburst has raised eyebrows. Besides, the grandstanding CNN pundit yelled during a quiet moment when he did not need to raise his voice (see video below). The brouhaha erupted on the White House lawn, when President Trump was coloring books with children who were enjoying the annual Easter egg roll. President Trump, who was surrounded by a sea of little kids, just ignored him. The Daily Caller’s Benny Johnson captured Acosta’s outburst in a Twitter video. You'll keep waiting. The difference in the media's orgasmic fawning over all things Obama vs. the abject hatred of Trump is nothing short of stunning. The somewhat surprising thing is, they've dropped all pretense of fairness & now relishes the role of a leftist propaganda firm. 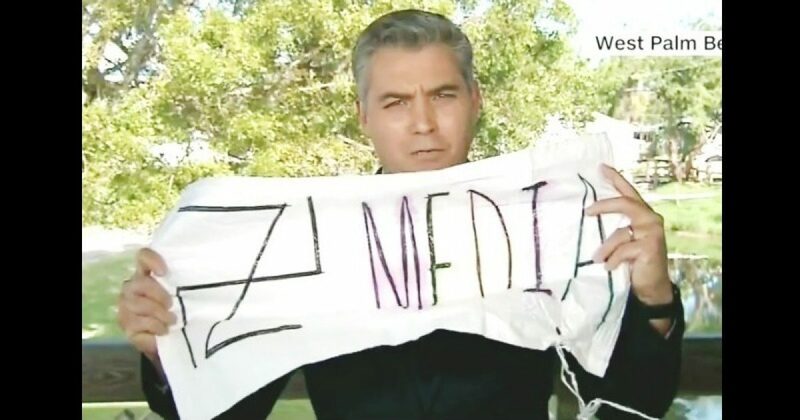 This is not the first time that Acosta has tried to hijack a White House event in his desperate bid to become the day’s viral YouTube sensation. In June 2017, Acosta played the “You-Ignored-Me” card when he accused WH press secretary Sarah Sanders of not calling on him even though there were many other media outlets at the press briefing besides CNN. Many people asked when CNN or any other media outlet rudely shouted out questions to the president of United States when he was coloring with children at an Easter egg roll. I covered a couple of Obama-era WH easter egg rolls. Yeah, but there’s protocol for White House Press Corps which you continually violate. That’s the point. Ask whatever you want but do it within the parameters you’ve been provided. Acosta is an embarrassment to America.